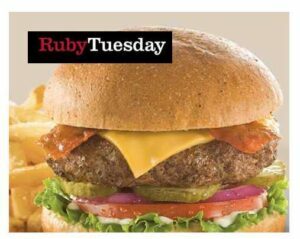 Head over here to enter your email address and you’ll snag a Ruby Tuesday coupon good for $5 off two adult entrees purchase at Ruby Tuesday! You’ll receive your coupon via email within a few minutes. While supplies last. Fine print: Present coupon at time of order. Not valid with Steak or Lobster limited time offers, daily specials, other coupon or holiday offers, for alcoholic beverages, or in conjunction of GiveBack program. Limit one coupon per check. Valid for dine-in only. Credit card payment is required to redeem.